In the twentieth century, as the population grew, the planet became smaller. The invention of the airplane opened up new possibilities for the future, a modern age of travel in new frontiers. Charles Lindberg was an engineer who had a custom built airplane made called the Spirit of St. Louis, and he took a personal interest in overseeing its development and helping with many suggestions. He wanted an airplane that would fly over the ocean, as lightweight as such a big rig could be, so the weight of something like a radio made it unimportant to him to have on board.. He was an architect who made a plan and put it in action. He enlisted the cooperation of the plane manufacturers, sought help from the weather department, the state department, the news media and steamships, to learn of landmarks, islands, and coast towns; studying maps of the prevailing winds, the coasts, interior, islands and steamship routes. He envisioned the city of St. Louis as the hub of aviation, with one of the finest commercial airports in the United States, a central changeover to all directions, a stopover from L.A. to New York, or Chicago to New Orleans. He believed that this trip, and the name of this plane, would revive St. Louis interest in aviation, advertise the city, help make America first in the air, and promote an interest in aeronautics. For him this incredible journey was built in a notebook like a blueprint or business plan, all his steps outlined in preparation. His first test flight was on April 28, 1927 and lasted 20 minutes. He made nearly two dozen more test runs in California, most 5 to 15 minutes, and one for a little over an hour. One test flight he would bring along Donald Hall, the designing engineer, on another, his photographer, Major Erickson. On May 10 he left San Diego en route to St. Louis and arrived there on May 11th, 14 and a half hours later. The next day he left Lambert field in St. Louis for Long Island, New York where he did some more test flights with an instrument expert and whirlwind experts. On May 20 he took off from Roosevelt Field in Long Island for his historic journey across the Atlantic landing on May 21st at Le Bourget Aerodrome in Paris, France, 33 and a half hours later. On this first transcontinental flight, the Spirit of St. Louis was traveling over the ocean about as fast as a Randy Johnson fastball, but Lindberg’s future goal was to compete with the speed of the earth’s rotation and travel around the world as fast as the sun itself! He was received in Europe like the rock stars of the sixties. It was like a Beatles scene when he arrived there. According to Lindberg, “I had no idea that my plane had been so accurately reported along its route and when I circled the aerodrome it did not occur to me that any connection existed between my arrival and the cars stalled in traffic along the roads. When my wheels touched earth, I had no way of knowing that tens of thousands of men and women were breaking down fences and flooding past guards.” Souvenir hunters nearly tore apart his airplane. It was repaired to take off for Belgium a week later, and then England, where he had trouble landing when a frenzy of people broke through police lines to get a closer look, the pressure of the crowd damaging the stabilizer. Now we’re in a new age of the internet, broadening our world with instant communication. Ever since man set his sights on our planet from above it has opened new doors of discovery and mysteries to explore. John Glenn Jr. was the first astronaut, who rode the Mercury spacecraft, on the first United States mission Manned Orbital Space Flight. Mercury was designed to “sustain a man in a space environment for a given period of time, to protect him from external heating and acceleration during exit and reentry, to provide him with means for controlling the attitude of the spacecraft, to permit him to perform observations and a limited number of experiments in space, and to then bring him safely back to earth with sufficient location aids to permit rapid recovery by surface forces.” In the Pilot’s Flight Report: “A number of questions have been raised over the ability of a man to use the earth’s horizon as a reference for controlling the attitude of the space vehicle. Throughout this flight no trouble in seeing the horizon was encountered. During the day the earth is bright and the background of space is dark. The horizon is vividly marked. At night before the moon is up, the horizon can still be seen against the background of stars. After the moon rises & during the flight, the moon was full, the earth is well enough lighted so that the horizon can be clearly seen. 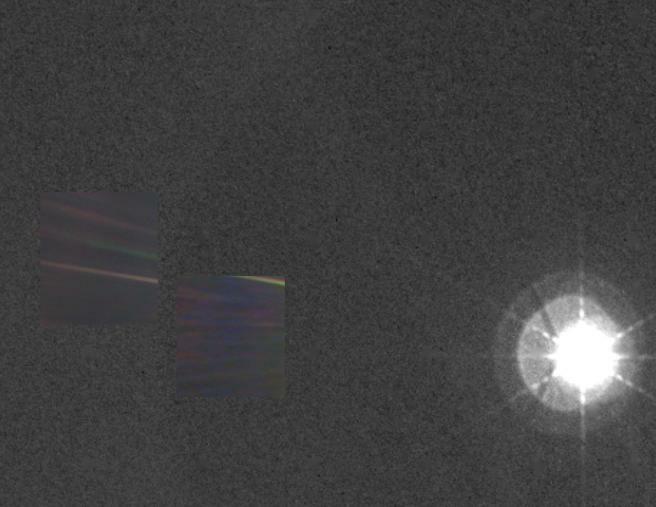 With this horizon as a reference, the pitch and roll attitudes of the spacecraft can easily be controlled. The window can be positioned where you want it.” Communication, and astronomical, meteorological, and terrestrial observations bring descriptive results. There’s no place like our home! NASA has shed new light on earth science, launching missions with practical and relevant research that will explore our planet to help us deal with environmental problems from a new perspective. Some of the recent satellites launched to explore and improve our environment on earth include: The Global Precipitation Measurement Core Observatory, observes precipitation on earth, rain and snowfall; the Soil Moisture Active Passage Mission Observatory will map the amount of moisture in the earth’s soil; Orbiting Carbon Observatory is a mission NASA describes as “watching Earth breathe”. Important instruments deployed to space include: International Space Station-Rapidscat that will measure ocean wind speed and direction and the data will be used to aid weather and marine forecasting to determine weather patterns and climate. Eric Lindstrom, program scientist says “International Space Station-RapidScat will extend NASA’s measurements of winds at the ocean surface. This knowledge has been critical to mariners since the invention of boats, and is critical today, both for our marine economy and for understanding the role of ocean in climate. It’s really amazing all the uses we have found for a radar in space that measures the ripples on the sea surface." The Cloud-Aerosol Transport System (CATS) measures airborne particles and clouds. It focuses on what’s in our atmosphere, particularly aerosol particles that pose human health risks, and influence our climate. There is a problem yet to be dealt with. It’s the space debris, garbage cluttering the space surrounding our planet. Satellites orbiting within 1200 miles of Earth represent about 5% of the objects there. 95% is space junk, "derelict spacecraft, discarded launch rockets to explosive bolts, lens caps, flecks of chipped paint, and tens of millions of smaller particles". Orbital debris also results from accidental explosions and collisions of objects. There are more than sixty countries and numerous companies with satellites in orbit and no international body regulates them. The more debris, the more difficult and expensive space missions become. The frequency of object launches causing the increase, congestion of space debris, poses a risk of collison. This is the orbital environment where all manned space launches have gone (except for the lunar landings). Space is a big place. We should be grateful to access this technically artistic, low orbit environment , the author of the universe created, and endeavor to clean up after ourselves. Our environment includes our habitat, and our extended domain into space, all the conditions, circumstances, and influences surrounding and affecting the development of organisms. We must be aware of the reality of the climate crisis at hand, and the problems caused by littering, and dumping garbage into the ocean, in order to help find the solution to pollution on our planet. Climate changes, we witness everywhere globally, shows us extreme developments in the atmospheric conditions, with bigger results that last longer, bringing us chaotic and eccentric weather. On a positive note, Earth’s fragile ozone layer is beginning to recover, mainly due to the phase out of some chemicals used in refrigerants and aerosol cans according to scientists who work on our ecological crises. The Deep Space Climate Observatory (DSCOVR) is managed by National Oceanic and Atmospheric Administration (NOAA) in partnership with NASA and the U.S. Air Force (USAF). It will operate a post nearly a million miles from Earth to help forecasters by collecting data on solar storms, solar wind, to give notice of solar stars that can disrupt communications, trigger power outages, or endanger polar air traffic & satellites. At this location it will have a continuous view of the Sun and the daylight side of Earth. DSCOVR will provide critical info about supersonic solar wind that streams from the sun to interact with Earth's magnetosphere & upper atmosphere." according to Tom Berger, director of NOAA & Space Weather Center in Colorado. "Most of us know this interaction through its generation of the Aurora Borealis or Northern Lights, the most visible aspect of space weather." On Sunday, we ride over to the launch pad view, near a bald eagle’s nest, we had to stop on the road to let an armadillo cross. There was so much anticipation and waiting as the countdown began. I was basking in the expectation of the rocket’s mighty roar, the blowback from the windy plume as the rocket rises. The tracking and ground instrumentation network play an instrumental role watching every detail with sure precision. When the countdown hit 2 minutes :31 seconds we heard, “It’s a no go for launch, no go for launch today”. The setback was overwhelming. The last time I felt disappointment like this was at a Grateful Dead concert in Sacramento outdoors on a Saturday night. They had closed their show with "Sugar Magnolia" and the audience was stirred with excitement as the band returned for an encore. They started tuning their instruments, and kept tuning them up as anticipation builds and expectation grew in the audience. The wait then was the same feeling I had waiting for the rocket to launch. Over twenty minutes they continued to tune up and then Bobby announced that “our instruments are broke. We’ll see you tomorrow.” The bringdown was overwhelming as we camped there that night and saw the next show at noon, when Bobby announced, “We’re going to start with last night’s encore.” I remember the great elation I felt and the energy rise when they played “One More Saturday Night”, the same ecstatic feeling I had when I saw this rocket lift off on Wednesday. The launch was scrubbed Sunday due to tech problems, postponed on Monday due to rain, and scrubbed on Tuesday because of high winds. Someone mentioned that this launch seemed to be hexed. Since the 23rd of January the launch was postponed three times in January and now had one more opportunity this week.The planet Mercury, closest to the sun, was retrograde for three weeks, January 21- February 11. This means at certain points on Mercury’s surface, an observer would be able to see the Sun rise part way, then reverse and set before rising again, all within the same day. This apparent retrograde motion of the Sun occurs because Mercury’s angular orbital speed exceeds its rotational velocity. Mercury’s elliptical orbit is farther from circular than that of any other planet in our solar system, resulting in substantially higher orbital speed near perihelion (when it’s closest to the sun). This astronomic effect affects our magnetic fields of influence. Three times a year this happens, and we notice with regularity how it impinges anything technological : computer crashes, cell phone glitches, cable out, communication breakdowns are all results. On February 8 the radar tracker failed on Falcon 9 causing the delay for launching. On February 11, a little after 6am, Mercury went prograde (direct). A little after 6pm DSCOVR was launched successfully on a SpaceX Falcon 9 rocket in near perfect conditions. We must remain vigilant. We now live in the age of recycling, renewable energy, wind power and solar energy, computer chips and mobile phones. Magnetic fields are also influenced by the solar rays. This 2 year mission for this satellite (with five years of fuel) will have a constant view of the Sun and the sunlit side of Earth. Al Gore issued a statement after the launch. “It was inspiring to witness the launch of the Deep Space Climate Observatory. DSCOVR has embarked on its mission to further our understanding of Earth and enable its citizens and scientists alike to better understand the reality of the climate crisis and envision its solutions. DSCOVR will also give us a wonderful opportunity to see the beauty and fragility of our planet and, in doing so, remind us of the duty to protect our only home." Uncle John @ Kennedy space center for the launch of the deep space climate observatory. voyager 1 & 2 are the first man-made satellites from earth to leave our solar system to search through intergalactic space. looking back from voyager we can now see our solar system looks like a giant eye. VOYAGER 1 HAs LEFT THE HELIOpause OF OUR SOLAR SYSTEM travelling through THE BOW SHOCK TO BEGIN ITS trip INTO INTERSTELLAR SPACE. 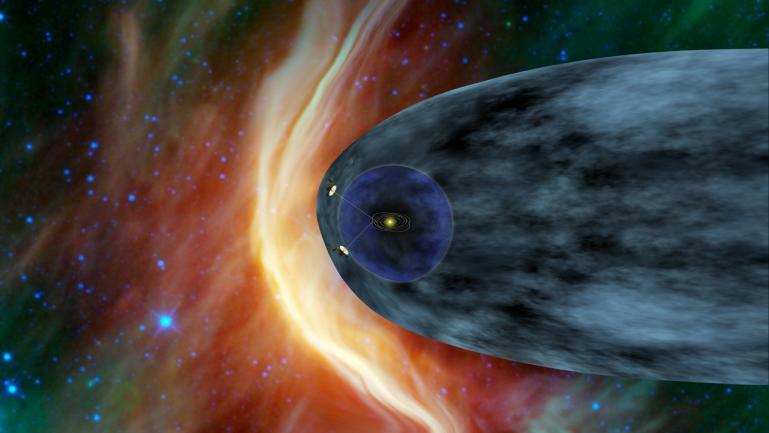 voyager 2 is still in the heliosphere, that is like a giant air conditioner. When voyager 1 went into the heliopause there was like a tsunami of interstellar wind. it then entered into a very hot space signaling the arrival into interstellar space. voyager 2, that has more working instruments than voyager 1, will leave the heliopause about the same time the first humans fly-by mars, a few years down the celestial road. its instruments will send a much clearer signal once it reaches interstellar space. both voyagers carry time capsules known as the golden record, a 12 inch, gold-plated copper disc with images and sounds of earth, so extraterrestrial intelligent life can learn about us. WE HAVE NOW GONE FURTHER THAN EVER BEFORE. THAT STAR IS OUR SUN ! Looking at our solar system from the outside in, God's view! Voyager 1 and 2 are presently in the "Heliosheath", the outermost layer of the heliosphere where the solar wind is slowed by the pressure of interstellar gas, and they are traveling at about 135,000 miles per hour! Voyager 1 is 11 billion miles from earth and approaching the "Heliopause" and about to leave our solar system to voyage into interstellar space. As the ship sails ahead a bow shock spreads around the vessel as it enters the frontier into new space. The earth will continue to receive signals for about another dozen years. Both vessels carry a greeting for any intelligent extraterrestrial life, on a golden phonograph record with sounds and images of Earth, including Chuck Berry singing "Johnny B. Goode". It has a shelf life of over 4 billion years.